The Personal Astrologer is for everyone, from the curious to the serious Astrologer. Introducing the 3 dimensional tool that shows you where and how to get your astrological readings. The Personal Astrologer with its visual and hands on features, makes the study of astrology fun and entertaining by literally placing thousands of astrological readings at your fingertips. A new and exciting tool of self discovery that takes you right to the heart of this fascinating subject. Within minutes of getting started you will have your natal birth chart and all the transiting planets set up and in their positions. The Personal Astrologer is literally a 3-D astrological chart and precision instrument that is a practical aid in the study of astrology. 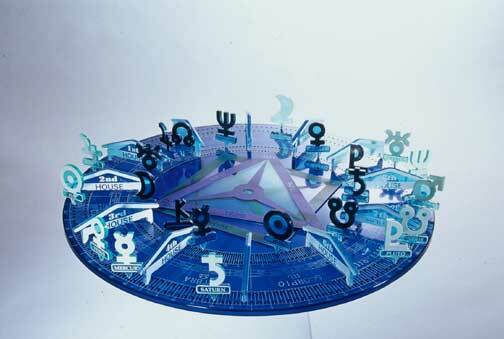 With the Personal Astrologer you can use any of your favorite astrological books to obtain your readings. © The art, writings and astrological readings found on these pages concerning Astrology, astrological aspects transiting planets and the trines, squares, oppositions and conjunctions they make to the Natal planets in the natal chart are the sole property and copyright of Planetary Visions. None of which is to be copied or reproduced in any manner without the written permission of the publisher. © Planetary Visions1998-2012 © The art work shown here was created by Joan Swann and is the property of Planetary Visions. The planetary photographs are (public domain) and the property of JPL,NASA and the American people whose taxes help make them possible.